We all know how easy print design is, which is why we chose the more interesting and challenging digital route. How ever I have to give it up for Made Thought because they produce some pretty swanky print work! Founded by Ben Parker and Paul Austin eight years ago, these guys have been busy churning out a lot of good work for some impressive clients. They have worked for MTV, Yves Saint Laurent, Nokia, The Mill, Adidas and many other hawt brands. In 2004 they were awarded ‘Graphic Designers of the Year’ by Blueprint Magazine. Wieden + Kennedy in London have launched this campaign for Nokia which allows the users to look through a made up persons phone. These made up people also have Facebook pages if you would like to get more personal with them or whoever does copy-writing for Wieden + Kennedy. The campaign has a really nice Group 94ish design which I really like however personally i simply dont care enough abot other people especiall made up ones to spend ages going to the vast librarys of content. I do appreciate that you can follow a little story about theese people which eventualy will accumulate with them having to take a dificult decission. Apperantly there’s a bit of a question mark over this campaign as nobody’s sure if it’s another Nokia Game in the vein of Sisu & Mika or 20 lives. The ARGers are all over it like a tramp’s coat just in case though – forums have been set up transcribing all the texts and FB entries waiting for the game to begin (if it is one). “Imagine finding a phone that belongs to somebody else; filled with personal text messages, contacts, diary entries, photos, voicemails and private video clips. It’s like having a window into somebody’s entire life. Would you be tempted to look through it? This question is at the heart of our new campaign for Nokia. 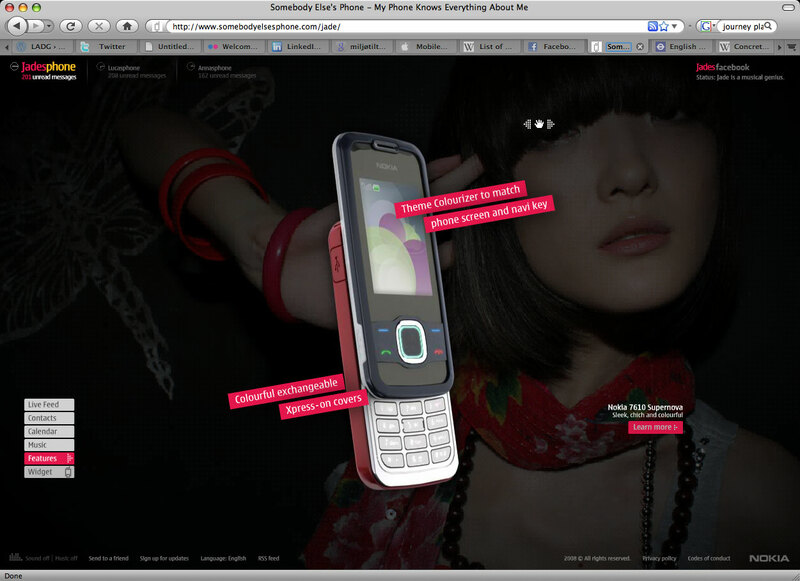 Inspired by the evolved role mobile phones play in our lives, the campaign invites the audience to explore the lives of three characters – Anna, Jade and Luca – in intimate detail, in real time, through their Nokia 7610 handsets…” read more at Welcome to otimism (Wieden + Kennedy blog).